Mad Men fans may be mourning the fact that the show won't resume until 2012, but at least they can mourn in style thanks to the Banana Republic Mad Men collection. Co-designed by Banana Republic creative director Simon Kneen and Mad Men costume designer Janie Bryant, this limited edition collection features classic pieces that straddle 60s chic and a modern sensibility. At the media preview I attended last week, I spotted plenty of leopard print, lace, full skirts, fitted cardigans and tailored dresses. Pumps, pearls and a leopard clutch rounded out the accessories selection. These pieces would be as appropriate for a Betty or Joan as they would be for a contemporary office setting. For the men, there were suit separates, cardigans, fedoras and cuff links. Guests sipped cocktails as they shopped the collection and enjoyed complimentary makeup touch-ups from BeautyMark. After all, it's hard to nail the 60s look without the perfect lip colour or cat's eye liner! So what did I pick up? These grey cigarette pants that I've been eyeing ever since the promotional pictures were released. The pants are a wool blend and fully lined, so I'll wait until the weather cools to do an outfit post. Pictures soon, I promise! I can't wait to "Mad Men" myself in them. Thanks to Banana Republic, Lisa Kwong and Tait PR for the invitation to the preview. To shop the collection, visit your local Banana Republic store or check out their website. This is a lovely collection. But I love anything '60s inspired so I'm an easy sell! Can't wait to sport my new leopard print clutch. It was lovely seeing you there. I tried to leave a comment this morning but it looks like it didn't go through. I love the cigarette pants you bought. I just got rid of all my dress pants because the cut and style of them are so old. I definitely want to add a pair of cigarette pants to my wardrobe. I'm looking forward to checking this line out in stores! 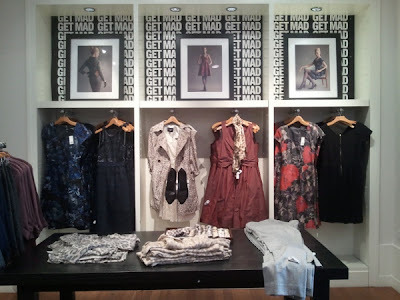 The Mad Men look is so classy and feminine! I can't tell you how glad I am this 1960s trend has caught on. Very chic era for clothes. I hate how they just ask if you're a Don or a Betty. Can't we be Joans? 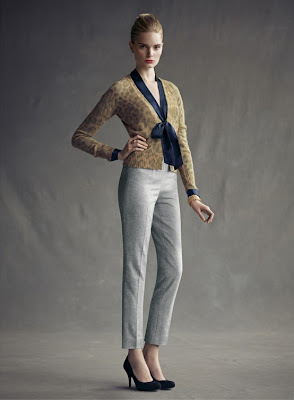 If I ever shopped at Banana Republic I would totally get those pants.